Well, this has certainly been a long time coming. One of the main reasons I started this blog was because a little Spain itinerary I wrote via FB message 5 years ago made the rounds throughout the years and I was shocked 4 years later to have someone reach out and say they were using it. 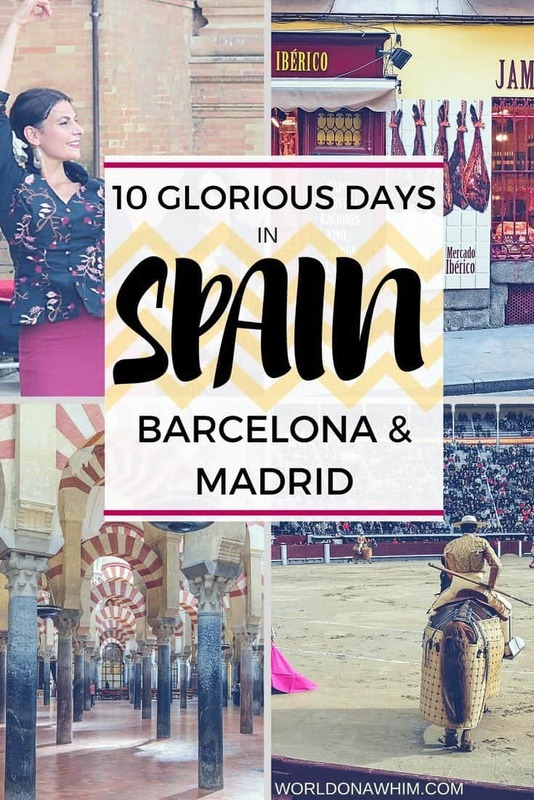 Truthfully, I couldn’t even tell you what was on there, but it really doesn’t matter because here goes –the official new and improved 10 day Spain itinerary. 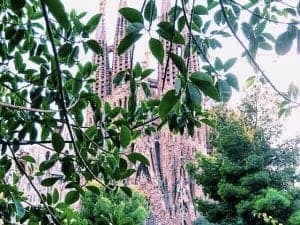 This post probably showcases my “perfectionist” tendencies more than any other; but, I lived in both of these cities for 4 months and a year, respectively, so I have to do Spain justice! BTW, if you want to cut this Spain itinerary down to 7 days, cut out Day 5, Day 6, and Day 9. Add Parc Guell to Day 1 and Retiro and Mercado San Miguel to Day 7 in place of your siesta. Fly into El Prat airport in Barcelona, Spain. El Prat is not especially close to the city center, but you have a few options. If it isn’t rush hour and you have some money to spend, I suggest taking a taxi. 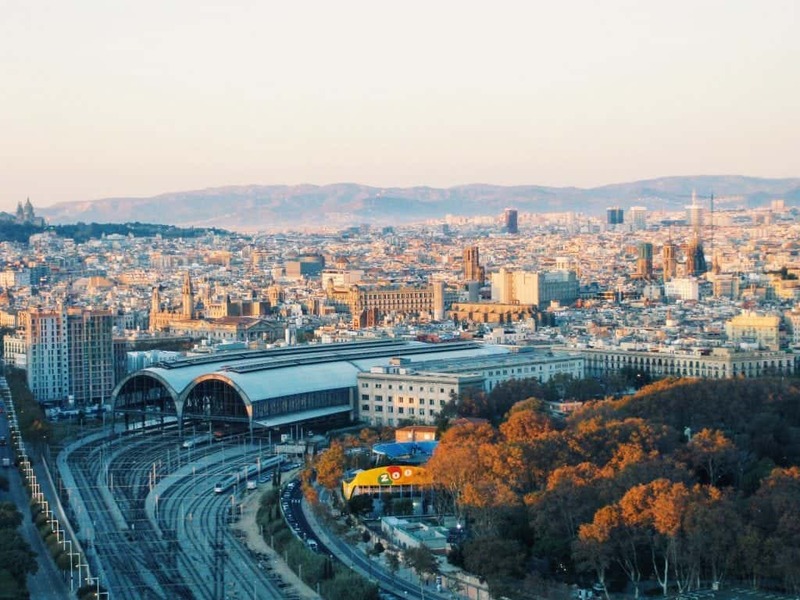 If you are more money conscious, you could do any of the following: 1) Take the Renfe train from Terminal 2 to either Sants, Passeig de Gracia, or Clot. 2) There is an airport bus that goes direct to the city center to the main square called Plaza Catalunya. The single ticket costs 5.90 euro. There, you can take the metro or walk to your accommodations if you are staying in the Gothic Quarter or the Eixample. These are the two places I recommend to stay; there are many hotels on La Rambla which is the main street in Barcelona, but it is very loud crowded. 3) Take the orange line, L9 metro, where you will most likely make a transfer at Europa Fira stop or Torrassa station. Buy the T-10 metro pass which will be good for…you guessed it…10 rides! Mercer Hotel Barcelona is a high rated 5*star luxury boutique hotel in Barcelona and is just a short distance from Plaza de Sant Jaume which is my FAVORITE part of Barcelona because it is the center of the Barrio Gotico (Gothic Quarter). H10 Cubik and is another great hotel in the Gothic Quarter and is literally just a few feet away from the Barcelona Cathedral. It has cutting-edge design as well as a rooftop plunge pool with great views of the city and is reasonably priced. P.S. If you would rather stay in the Eixample, then you must check out the sister property H10 Casa Mimosa which is 100 meters from La Pedrera. Click here for latest prices. El Palace Hotel is another 5* star hotel with outstanding reviews and is located in my other favorite area of Barcelona, the Eixample. The aesthetics of the hotel itself are that of grandeur but the interior has been recently renovated with all of the expected modern comforts. Mandarin Oriental Barcelona would be the property to stay at if you aren’t into the boutique style hotel and really want one of the most elegant properties Barcelona has to offer. 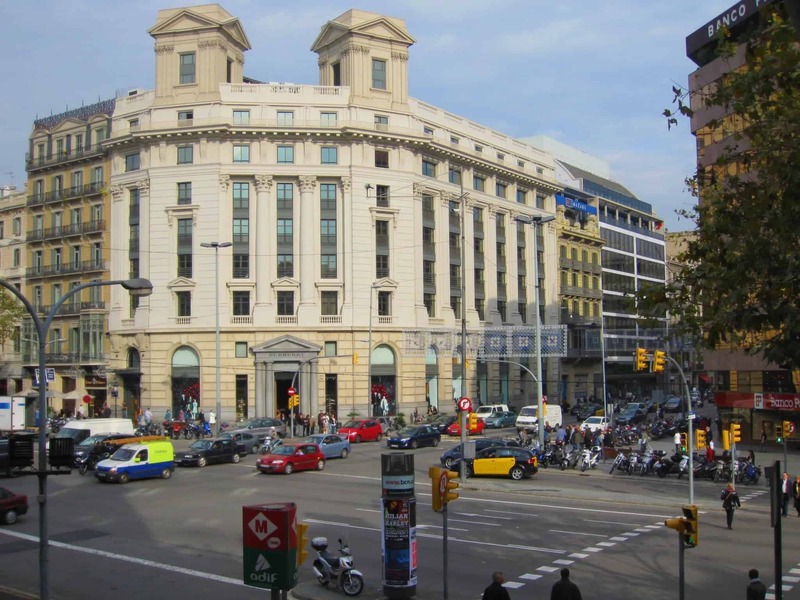 It is also in the heart of the Eixample right on the best street Passeig de Gracia. Best Hostels: There are SO many good hostel options in Barcelona, I have only listed hostels with a rating of 9.4 or higher. Hostel One: All of the Hostel One properties are the highest rated on Hostelworld although their locations are not my favorite. The best location is Hostel One Ramblas because it is not directly on Las Ramblas, but still in walking distance to it and the Barrio Gotico. The other two properties Paralelo and Sants are just too far out in my opinion. Yeah Hostel Barcelona & Sant Jordi Hostel Gracia – Both located in the area of Gracia which is outside of the center of the city, but a great location for backpackers. I heard someone call it the Brooklyn of Barcelona so hopefully that gives you a better idea of the vibe in Gracia. Rodamon Barcelona Centre and Frabrizzio’s Petitt – These are both in the PERFECT location. It’s a bit on the quieter side so if you are in Barcelona solely for the nightlife, check out the above hostels but if you are in Barcelona primarily to sightsee, then I would absolutely go with one of these two properties. Airbnb in Barcelona: There are a ton of great properties on Airbnb, but I think the best area to stay in Barcelona is either in the Barrio Gotico or Eixample. Feel free to reach out and email me if there is a property that you are interested in but aren’t positive about the location. Once you are settled into your accommodation, get out, wander the streets, and find a random tapas bar to sit down to eat and have a drink. I’m not going to plan too much to do today because everyone’s arrival time will vary. 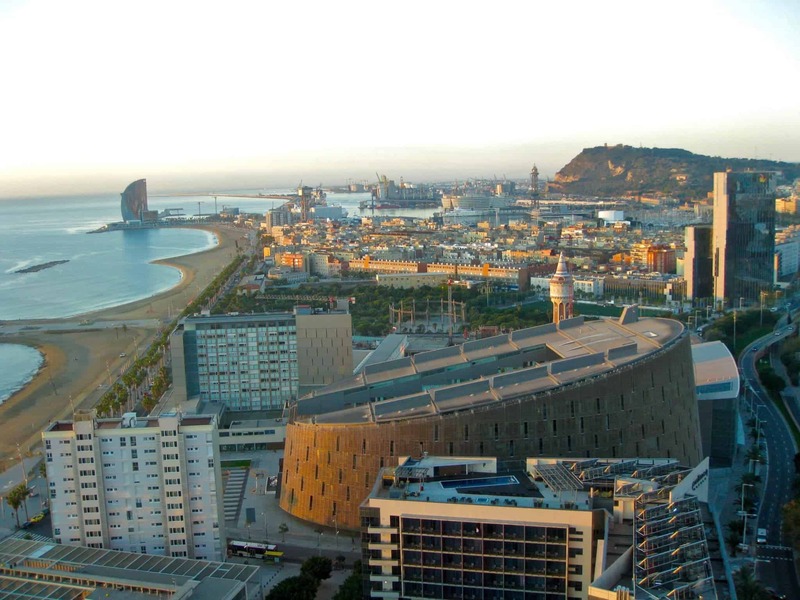 But, if you do arrive in the morning, feel free to add the Arc de Triumph, Parc Ciutadella, Tibidabo, or the Palau de la Musica Catalana to this day. My personal tradition is to go to a place called Bilbao Berria which is a pintxos-style bar (similar to tapas but a name used in the Basque country) where if you sit outside on the terrace, you have a breathtaking view of the Barcelona cathedral. The food isn’t life changing, but it’s decent, and I go because it’s a locale where you immediately get that “I’m in Spain” feeling sitting out on the terrace people watching. If you wish to visit the cathedral, there is free entry from 8:00 AM to 12:45 PM and 5:45 PM to 7:30 PM on weekdays. It’s open a little later on weekends. However, with all sights in Spain, double and triple check the hours because everything is constantly opening and closing! Expect that at least one activity you try to go to won’t be open when you get there and don’t get too upset about it because that’s the norm!! Take your first walk around the Gothic district, and check out the shops and souvenirs so you have some idea of what you would like to bring back from your trip. Next, head to El Born the trendy, artsy area of Barcelona which is the barrio (area) right next to the Barrio Gothico. Walk down the charming narrow alleys and grab a drink at one of the many cozy bars. If you aren’t too jet lagged and looking to bring a bit of excitement to your evening, you could check out Espit Chupitos, a bar with 500 shots, or Oveja Negra. Try a clara at Oveja Negra which is a combination of beer and lemonade and quite delicious! Both of these bars have two locations. Wake up the next morning, grab a cafe con leche and a croissant (Spaniards love to eat sweet in the morning), and head back to the Barrio Gothic district for a visit to the Picasso museum. Make sure to book tickets in advance! Otherwise the line to buy tickets to get into the museum will either be a) massive b) sold out. Also, I highly recommend purchasing the audio guide. Just include it to the price of admission for the ticket because it really helps hearing the stories behind the paintings. After the museum, walk to La Rambla, the most famous street in Barcelona. You will want to start from the “coast side” and slowly make your way up toward Plaza Catalunya. Marvel at the street performers, artists, and the total randomness that happens on this street. Just be vigilant with your bags because this is also where pickpockets love to grab your wallet. About halfway up, you will see gates to La Boqueria, the open air marketplace filled with every kind of food you can imagine. This is a perfect spot to grab a quick lunch, basically by snacking as you go from stall to stall. Be sure to check out the juice and marzipan vendors and steer clear of the fish section unless you have an affinity for smelly sea creatures. Once you’ve fully examined the market, continue walking past Plaza Catalunya. You will enter the Eixample district, a more upscale area with incredible architecture. Once past Plaza Catalunya, you will be on Passeig de Gracia, another main thoroughfare in Barcelona. Make your way slowly walking into all of the gorgeous stores until you get to Casa Battlo, one of Gaudi’s famous works. Personally, I prefer the interior of Casa Battlo to La Pedrera (also known as Casa Mila), so I recommend paying admission to enter Casa Battlo and buying a ticket to see a musical production on the roof of La Pedrera instead. Throughout the year, La Pedrera has live musical performances at night. On my last trip to Barcelona, I saw a phenomenal jazz group on the rooftop. You arrive with time to explore the roof, drink a complementary glass of champagne, and enjoy incredible music. You should purchase tickets in advance for both of these attractions. After a Gaudi visit or two, now would be a great time to siesta before heading to Montjuic for sunset. Montjuic, a small hill overlooking the Barcelona harbor, is very walkable or you can take a funicular up to the top. There are a plethora of museums and events going on at all times, but I just like to enjoy the views and watch the Magic Fountain show during the summer. Tonight would be also be an ideal night to enjoy the Barcelona nightlife. I recommend going to one of the beach clubs like Opium, but there are also some great ones in the city like Apollo, Razzmatazz, and Otto Zutz depending on your clubbing style. As for bars, there are seriously too many to name, but keep in mind, dinner in Spain is usually around 9/10 and people won’t start heading to the bars until around 11. Clubs don’t really get popping until 2 o’clock at the earliest. Ok, actually, if you have the opportunity, check out Old Fashioned bar in Gracia. It’s by far the coolest bar I have ever been to anywhere in the world. Feel free to wake up a little later this morning before heading to Sagrada Familia, arguably Gaudi’s most famous piece of architecture in the whole city. Once again, buy tickets in advance. Spend some time exploring both the interior and exterior of this incredible basilica. Next, grab the metro at Verdaguer and head to Barceloneta on the yellow line for the BEST part of the trip! La Champagneria! Also known as Can Paixano!!!!! This amazing, incredible, spectacular, glorious place is a dive bar with ridiculously cheap and delicious champagne. Before 5:00 PM, you can buy bottles of champagne to drink at the bar with the purchase of 2 food items. My vote is for the Pollo con Pimientos sandwich. After 5:00PM, you can get glasses of champagne for a little over 1 euro. Just be sure to get to Can Paixano early because of the bottle service situation and the fact that this place gets packed as the day progresses with locals and tourists alike. Afterward, you will probably be in a food and drink coma which makes it the perfect time to head to the beaches at Barceloneta. Don’t expect Barceloneta to be a relaxing, beautiful beach where you can tan peacefully with a mai tai in hand. Instead, picture the most crowded beach you have ever been to, multiply that number of people by 10, and add +100 vendors coming up to you every minute trying to sell massages, beverages, and knick knacks galore. There are some amazing souvenir vendors near the port though, if you do wish to do a bit of shopping after the beach. Or, grab a bike and ride along the coast once that champagne buzz has worn off. Tonight would be a great night to go out to a nice dinner. There are over 7,000 restaurants to choose from on TripAdvisor so my recommendation would be to put in your current location and find a good spot nearby. Sensi Bistro and Napa are a few of my favorites. 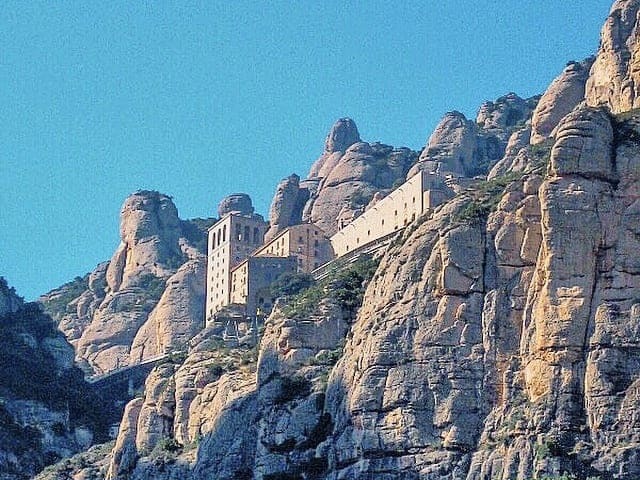 Start the morning with a half-day trip to Montseratt, an incredible monastery on top of a huge mountain. To get there, take a one hour train ride to the bottom of the funicular on the R5 toward Manresa which you can get from the metro stop Plaza Espanya. From there, it is another 23 minutes up the cable car to the top of the mountain. You want to make it to the top by 1:00 PM so that you can hear the boys choir perform in the Basilica. Continue to walk around the mountain and be sure to sample the fresh goat cheese from the street vendors. It is so delicious! When you are ready, head back the way that you came. I am putting a visit to Camp Nou (Barcelona’s soccer stadium) for this afternoon but obviously there is just no way for me to know when there will be a game; however, you should absolutely plan your Barcelona trip around seeing a futbol match one of the nights. If you are not in town when FC Barcelona is playing, you can always take a tour of Camp Nou. From Monsteratt, you take the green line 5 or 6 stops to Maria Cristina or Palau Reial to get to the stadium. Unless you are a major futbol fan, it is not really important where you sit and more about just having the experience of seeing what a game is like in a city that take so much pride in their sport. 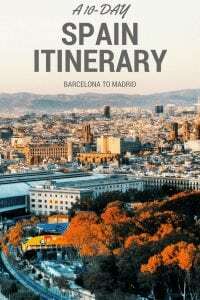 I am only recommending a full-day trip to Figueres and Girona if you have the entire 10 days to explore Barcelona and Madrid. Otherwise, skip ahead to Day 6. 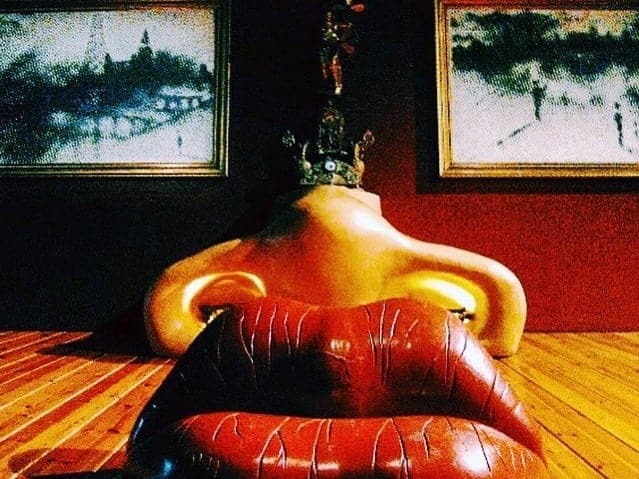 In Figueres, you will go to the Salvador Dali museum, an incredible exhibition of a prolific artist’s work. You will also walk around Girona and explore one of the best preserved Jewish quarters of any European city. Girona was also the location for an iconic Game of Thrones scene. I suggest a guided tour for this trip even though you could plan the day on your own. I just think there are a lot of moving parts and if you are going to splurge on one guided tour, this would be the one. 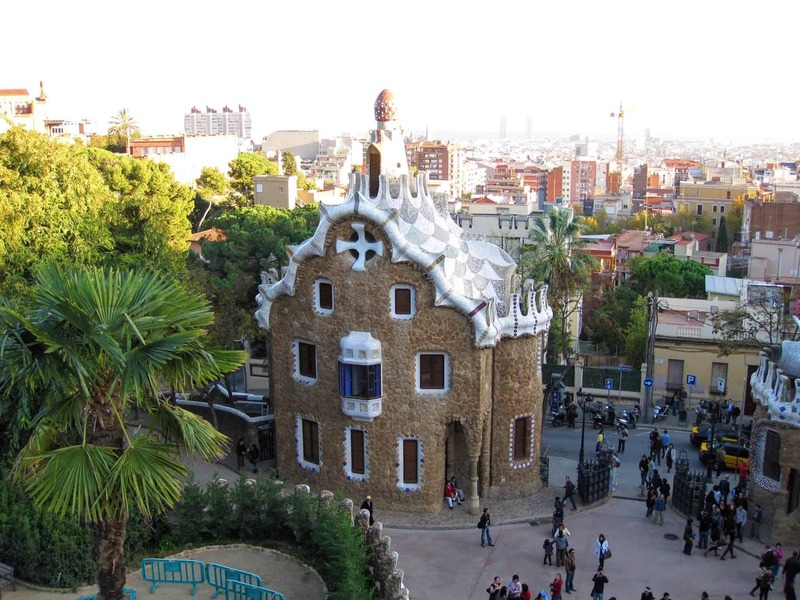 Before saying goodbye to Barcelona for the time being, head to Parc Guell, the last major Gaudi sight on your list. Buy tickets ahead of time for this one as well because you are actually given an entrance time to enter the park. Parc Guell is a little out of the way, so make sure you wear some comfy walking shoes. Once you get off the metro at Vallcarca, it is all uphill from there. You could also take the #24 bus from Plaza Catalunya for a shorter walk. From here, go back to your accommodation, grab your luggage, and head by bus or Ave (train) to Madrid. Once in Madrid, you can easily take the metro from Atocha to your next accommodation. Here’s the thing about Madrid to keep in mind. Madrid is less about the sight-seeing and more about immersing yourself in the authentic Spanish culture. So this evening, depending on budget, make your way to another dive bar favorite, El Tigre in Gran Via or El Botin in Sol, the oldest restaurant in the world. The quality of the food at El Tigre is not the best you’ve ever had, but the amount of free tapas you receive with your drink order is unbelievable. I highly recommend getting the sidra (cider) here. El Botin is expensive, but the ambiance is amazing, Hemingway used to write there, and the notoriety of the place is worth it if you can splurge. You can also go to El Botin for a coffee and sweet treat during the day if you don’t want to eat a proper meal there. Once you’re finished, spend the night walking the streets and bar hopping. You will be right near the city center so you won’t have any problems getting in on the action. The Principal Madrid is a luxury boutique hotel right in the heart of Madrid. It is one of the prettiest buildings in all of Madrid and you can admire the insane views of the rest of the city from the rooftop terrace. The staff at The Principal Madrid is incredibly courteous and there is even a two-star Michelin restaurant inside the property. Hotel Atlantico is not only my top budget hotel choice, but it is also the only hotel in my number one favorite area of Madrid, Malasana. Personally, I feel like you can not find a better location and the prices for the Hotel Atlantico remain in the $100-$200 range even through the summer months. It’s a 4*star property with 2 terraces and panoramic views of the city and all around great option. Only YOU Boutique Hotel Madrid – Surprise, surprise…another hotel with an outstanding location. Clearly that weighs heavily in determine my go-to hotels in Madrid. This is a boutique property in a great neighborhood (Chueca) near tons of restaurants and bars. The aesthetics of this hotel are much more youthful and trendy as is the area in which it is located so keep that in mind as I imagine that could either be a pro or a con depending on what you’re looking for! Hotel Ritz Madrid is a luxury property that emanates old world elegance. 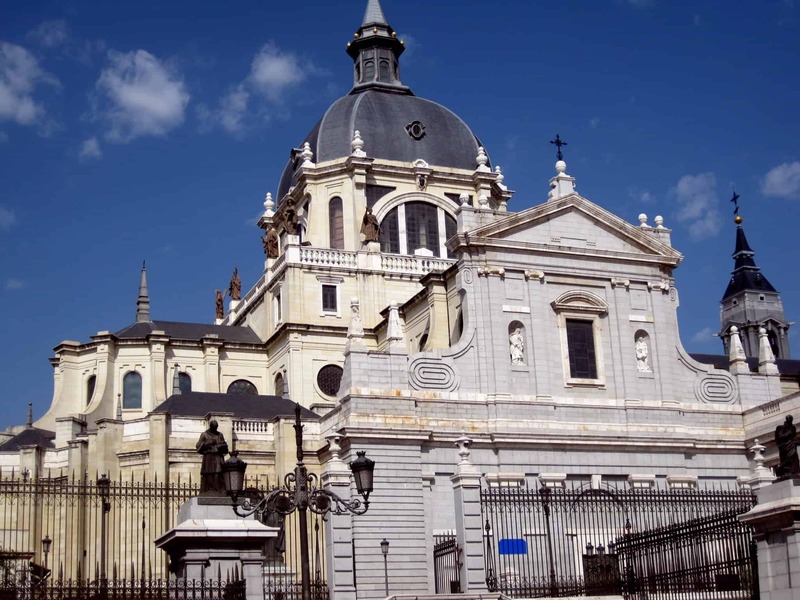 It is located right next to the Prado Museum and Retiro park which are two must-sees during your time in Madrid. *Built in 1910 at the behest of King Alfonso XII, this property is undergoing a massive renovation project and won’t be open for most of 2018. While the renovation is taking place, an alternative would be the Westin Palace Madrid. Click here for the latest prices. Best Hostels: Both hostels have outstanding reviews and are right in the city center. Perfect locations. Enough said. And both have female dorms. Honorable Mention goes to The Hat Madrid and Way Hostel. Airbnb in Madrid: There are a ton of great properties on Airbnb, but my favorite areas to stay in Madrid are Malasana, Gran Via, Chueca, Huertas, La Latina, Atocha, and near Paseo del Prado. Feel free to reach out and email me if there is a property that you are interested in but aren’t positive about the location. Wake up for a free walking tour to get a lay of the land in Madrid and a historical overview of Madrid the city and Spain the country. Sandemans New Europe has tours at 10:00AM, 11:00AM, and 2:00PM and meets near the Tourist Information in Plaza Mayor. Personally, I prefer this to the Hop On Hop Off in Madrid; however, if you have mobility issues, then that would be a great alternative. Be sure to tip your tour guide at the end of the tour! Afterward, find a restaurant with a Menu del Dia, a 3-course meal similar to a price fixe but for only 12-15 euros! A menu del dia is a traditional Spanish lunch, so it won’t be difficult to find a spot that has one available. After your inevitable food coma, embrace the lifestyle and take a siesta, because that’s what you do in Spain! So. Glorious. Most everything is closed anyway and you just walked a whole lot during your tour. Just to clarify, a siesta in Spain doesn’t necessarily mean a full-on nap although more power to ya if you can do so. More commonly, you will see Spaniards sitting at a cafe in a plaza drinking coffee, beer, or a glass of wine. Once you are rested, visit either the Reina Sofia museum (modern art) or the Prado museum (one of the world’s finest collections of European art). Both museums are free nightly; the Reina Sofia from 7-9 Monday, Wednesday-Saturday and 1:30-7 on Sundays, and the Prado from 6-8 Monday thru Saturday and 5-7 on Sundays and holidays. At night, you need to check out this incredible flamenco place, Tablao Flamenco la Quimera. It is super authentic which is very different from the majority of “flamenco” shows you would find in Madrid. Shows are typically at 10:00 PM and you will need to call or email to make a reservation. FYI, it’s a bit outside of the city center, so you will need to cab it or take the metro about 7 stops. 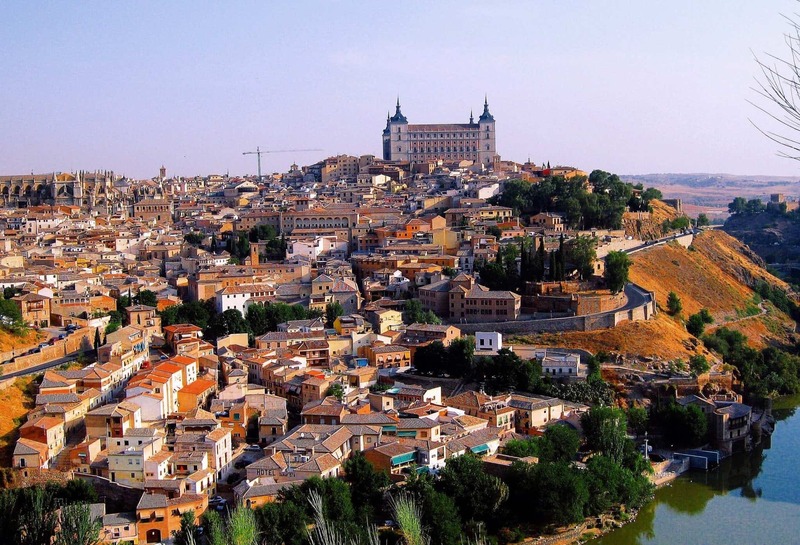 For Day 8, choose between two potential day trips: Toledo or Segovia. Personally, I would go with Toledo because I think it is a prettier city; however, I feel as though these two excursions are split 50/50 when it comes to which one people prefer. To get to Toledo, you can either take a train from Atocha (costs about 14 euros each way and takes a half hour) or a bus from Plaza Elliptic (costs 5 euros each way and takes an hour and a half). Once in Toledo, make an effort to get lost in the city;it’s small enough where you will find your way back! Highlights include La Catedral Primada and the Mirador del Valle (the view of the city), but there are a plethora of places to see like the El Greco museum and monastery. Souvenir specialities include swords and marzipan sweets while lunches are known for partridge stew and a pork dish called carcamusa. 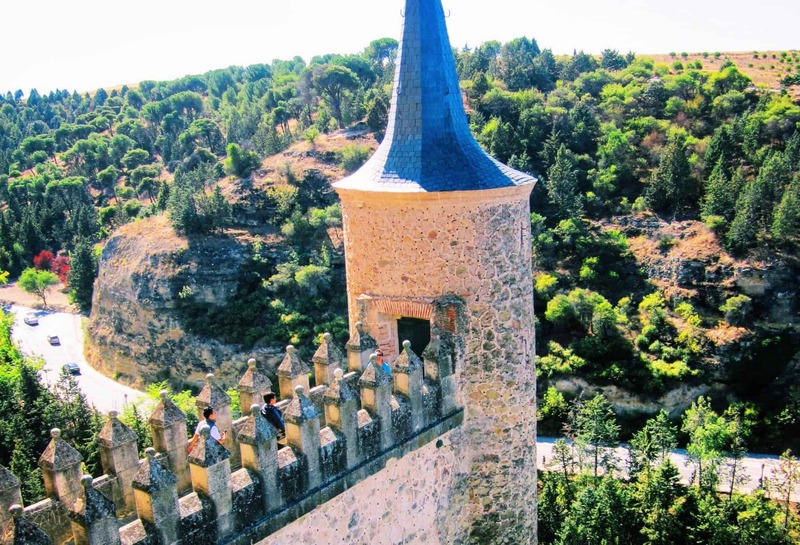 Should you choose to go to Segovia instead, plan your day around visiting the aqueduct and the castle, Alcazar de Segovia. Sleeping Beauty’s castle at Disneyland is said to have been modeled after the Alcazar, so you know it’s impressive! You can take the AVE train from Chamartin train station for about 10 euros and the ride will only be about a half an hour. After returning from you day trip, make your way to La Latina area, namely Cava Baja street, for some of the best tapas all in one centralized area of Madrid. Bars will be filled with locals and tourists all enjoying their evening of eating and drinking. I’m going to keep it pretty casual today as I think it is important at the end of the trip to collect yourself before flying home the next day. That being said, you can definitely check out some of the other Madrid tourist attractions that you may not have fully explored on the walking tour like the cathedral and palace or Temple de Debod (the sunsets here are incredible). Afterward, get some tapas at the open market, Mercado San Miguel, which is near Plaza Mayor and Sol, the main plaza of Madrid. 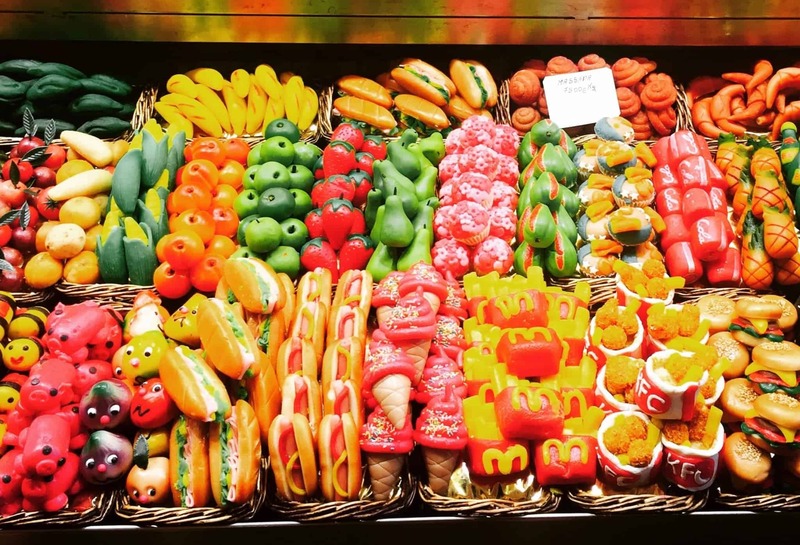 Pick up a napolitana de chocolate from Madrid’s most famous bakery, La Mallorquina, as well as some other picnic foods and take the metro to Retiro park. Spend the rest of the afternoon at the park playing cards, drinking vino and enjoying the scenery. Retiro is a massive park that has a ton of areas to explore. If you aren’t too museum’d out, you can visit the museum you passed on 2 days ago for free in the evening. For your last night, make sure to explore Malasana, a bohemian district that has incredible nightlife. If you wish to go out to the club, Kapital, Pacha, and Joy are some of the most popular choices. Whatever you do, make sure to end your Spain trip at Chocolateria San Gines for some late night/early morning churros con chocolate. I mean really…how else would you want to end a trip to Spain?! It’s time to say hasta luego to Spain. The airport in Madrid is very easily accessible by metro. BTW: If you are doing your Spain trip in reverse–starting in Madrid and then heading to Barcelona– take the metro to your accommodation from the airport. On Day 6, when you are going from Madrid to Barcelona, the Ave train would leave from Atocha train station which also has a metro station attached and is centrally located. The bus stations are also extremely accessible by metro. Then, you can taxi to El Prat, Barcelona’s airport on your way back home on Day 10. Are you on Pinterest? 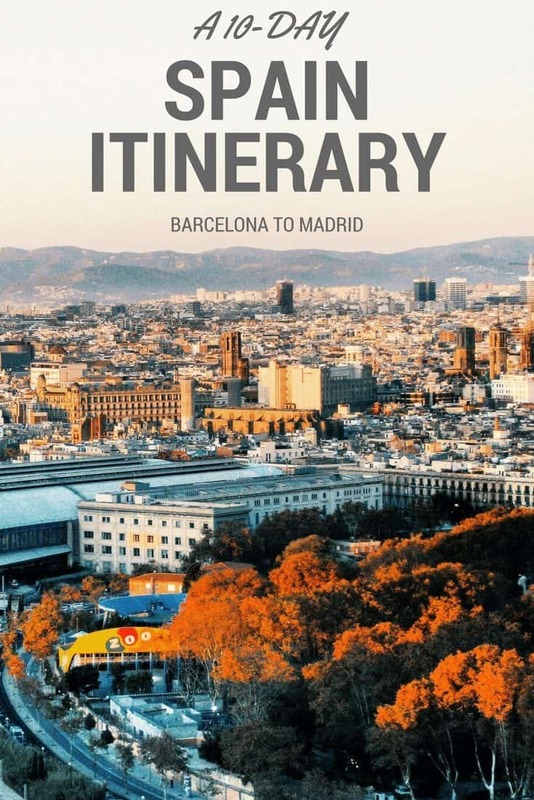 Pin this Spain Travel Itinerary for later! This post contains affiliate links. That means I receive a small commission if you make a purchase after clicking the link. Did you like this post? Please follow me on Facebook for more updates!